Well since the weather in my area has taken a turn for the cold and rainy, I thought I’d take care of a few odds and ends with the kit. First up, I recently ordered a graphics upgrade package specifically designed for the Mark VI with electronics. I used a sharp pair of scissors and hobby knife to trim them up. One thing to note is that this upgrade package did not include graphics for the handscanner, so I used the ones supplied with the kit. This involves applying the included contact-paper to the graphics, and then cutting them out. I used a wide putty applicator to flush out any air bubbles between the contact-paper and the graphics. 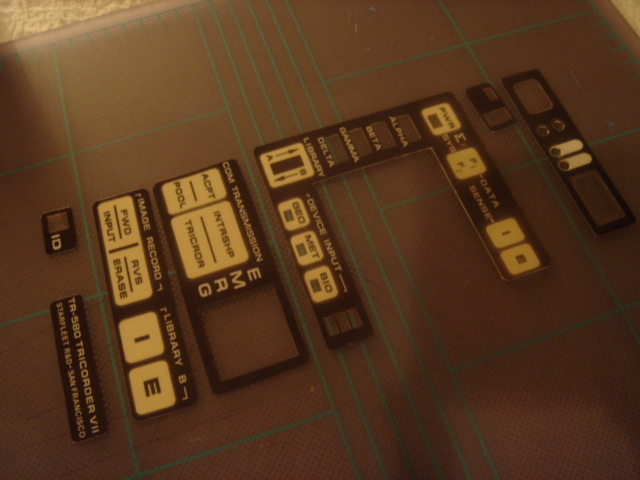 I then used my scissors to cut out the graphics for the scanner. I also cut out the remaining mask, which will be used for the EMRG area of the lower door. After that, I tackled, what I will refer to as, the reflector housings. These three pieces come together on a piece of plastic. 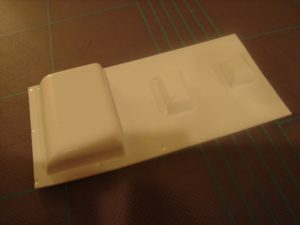 They are designed to work in conjunction with the electronics to focus the light for the main viewscreen and two of the LEDs on the top array. I cut them out using my hobby knife, and then sanded them down with 150 grit paper to even out their edges and remove any burrs.